Five percent of individuals worldwide develop an autoimmune disease. The causes of the majority of autoimmune diseases is unknown. But it is recognised that various tissues are damaged by over-activation of our immune system in response to self-components that are altered by an earlier immune reaction, for example an infection. The initial insult is often distant to the site of autoimmunity. In the case of rheumatoid arthritis, evidence suggests that infections of mucosal surfaces such as the mouth, gut and lungs act as early triggers of autoimmunity. Fig. 1. 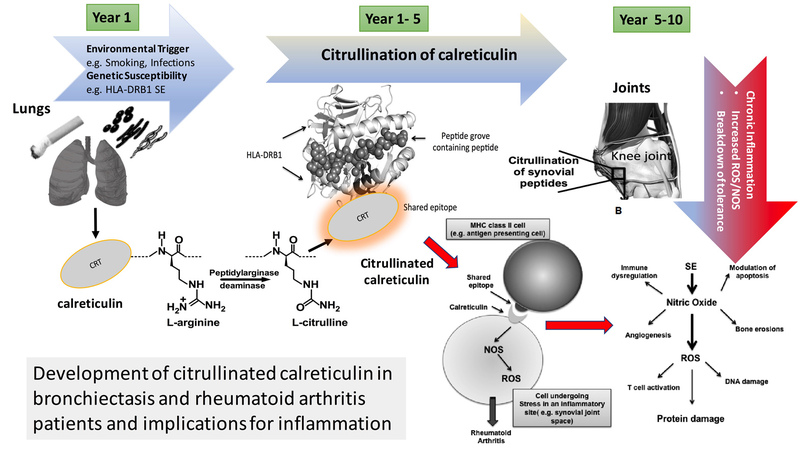 Citrullinated calreticulin in lung disease and rheumatoid arthritis. Lung infections combined with genetic susceptibility and environmental factors may collectively induce a person’s immune system to react against ‘self ‘, sometimes years in advance. Dissecting out the development of rheumatoid arthritis is complex due to multiple risk factors. One environmental risk factor that we are frequently exposed, is the inhalation of microorganisms into our lungs. A lung disease called bronchiectasis, comprises of enlarged lower airways in the lung, resulting in excessive mucus and colonisation by bacteria. Chronic inflammation ensues in the lungs, resulting in excessive coughing and production of phlegm and blood. Patients with bronchiectasis have a high risk of developing rheumatoid arthritis. Individuals with bronchiectasis who do not have rheumatoid arthritis often present with diagnostic markers of arthritis such as rheumatoid factor and autoantibodies against citrullinated peptides. Recently we investigated a number of bronchiectasis patients as they developed rheumatoid arthritis. This allowed us to monitor the early breakdown in immune tolerance against a number of established rheumatoid arthritis-associated risk factors. An early diagnostic marker for rheumatoid arthritis, is the chemical modification of amino acids especially arginine to citrulline. This modification initiates the production of anti-citrulline autoantibodies often years before symptoms of disease are detected. One normally intracellular protein – calreticulin is prone to citrullination in people with both bronchiectasis and/or rheumatoid arthritis. If these people also have a particular genotype termed HLA-DRβ, they acquire a protein on the surface of some of their cells that contains a 5-amino acid conserved peptide call the ‘Shared Epitope’ (SE). It has been shown that calreticulin binds moderately to the SE, but when citrullinated binds with greater intensity. This interaction signals the cell to trigger a number of proinflammatory mechanisms including nitric oxide pro-oxidative signalling pathways. Therefore, excessive generation of citrullinated calreticulin in susceptible individuals might worsen their disease. Previously we detected extracellular calreticulin in the joint synovial fluid and serum of rheumatoid arthritis patients. In our recent study, we detected the presence of citrullinated calreticuln in patients with bronchiectasis prior to them developing rheumatoid arthritis. Given the pro-inflammatory characteristics of citrullinated calreticulin this might be important in the breakdown of immune tolerance. Development of autoantibodies to some self-proteins signifies breakdown in immune tolerance. Autoantibodies to calreticulin have been observed in several autoimmune diseases, but rarely rheumatoid arthritis. However, rheumatoid arthritis patients do develop autoantibodies to numerous citrullinated proteins at a pre-symptomatic stage of their disease. We observed that 35% of patients with either bronchiectasis or rheumatoid arthritis alone developed antibodies to citrullinated calreticulin, increasing to 58% of individuals who had both conditions. This suggested that citrullinated calreticulin detected in SE+ve bronchiectasis patients may increase their susceptibility to inflammation due to citrullinated calreticulin-shared epitope interaction, independent of other risk factors such as smoking. Upon screening the sera of patients with bronchiectasis prior to them developing rheumatoid arthritis, we detected citrullinated calreticulin in these patients. Three out of four bronchiectasis patients who developed rheumatoid arthritis were also SE+ve. This potential role of calreticulin in rheumatoid arthritis pathology is further supported by the independent development of cyclical mimetic peptides that compete with calreticulin for binding to the SE, inhibiting SE signalling via the calreticulin-SE pathway reducing bone damage in an arthritis model. Heightened autoantibody immune response to citrullinated calreticulin in bronchiectasis: Implications for rheumatoid arthritis.